Oh, hello Monday. Fancy meeting you here, yet again. It’s too early for me to be dealing with you. I realllllly need my breakfast before I can even think about facing you. I’m making a lifestyle change when it comes to my diet. Or, I guess I should say that I’m researching and making small changes toward a bigger change. My plan is to try it all out for a few months and see how I like it before sharing too much about it. What I will say is that there will be lots of potatoes in my near future and I am not complaining about that! What I really don’t understand is why we don’t eat sweet potatoes for breakfast more often. Why?? (this also applies to butternut and acorn squash and the other sweet starchy foods) They’re SO perfect for breakfast. Tasty ✔ Nutritional ✔ Super filling and satisfying ✔!! 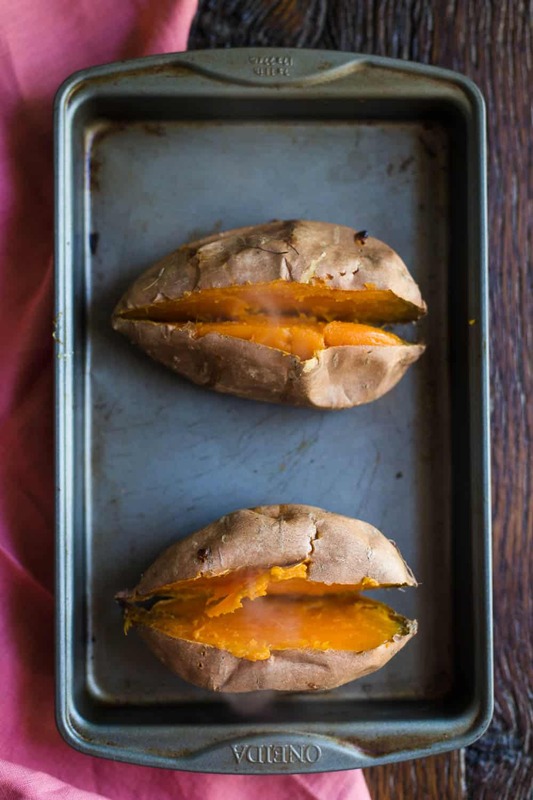 The only downside to sweet potatoes is that they take a while to bake. My solution is to simply bake them the night before. Typically whenever I bake potatoes, I end up baking more then I need for dinner (sometimes on purpose, most of the time not). 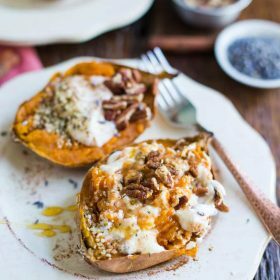 The easy solution to this is simply to pop the leftovers in the fridge and then eat them the next morning for breakfast! Easy! Because, unless it’s the weekend, I do NOT have time in the morning to wait for a sweet potato to bake. Nope. Not gonna happen. I’ve eaten sweet potatoes for breakfast in a few different ways. First I tried it with a bit of oat meal inside. That was tasty but almost too filling. My favorite SP for Bfast combo is mashed sweet potato + yogurt (with a few toppings of course!). If it’s a weekend, I’ll bake my sweet potato the morning of. Otherwise, I’ll bake it while I’m making dinner the night before. Then all you need to do is heat it up and then fill it with your favorite bfast toppings. And not that it needs any additional sweetness, but I like to drizzle mine with a bit of honey or agave. Baked Sweet Potatoes for Breakfast. DO IT!! 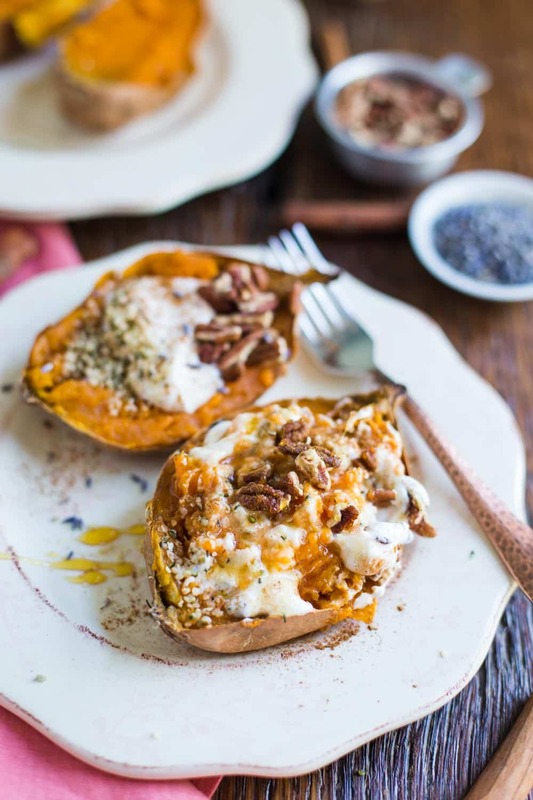 I’ve also tried this with acorn squash AND butternut squash and it’s equally as delicious and satisfying! 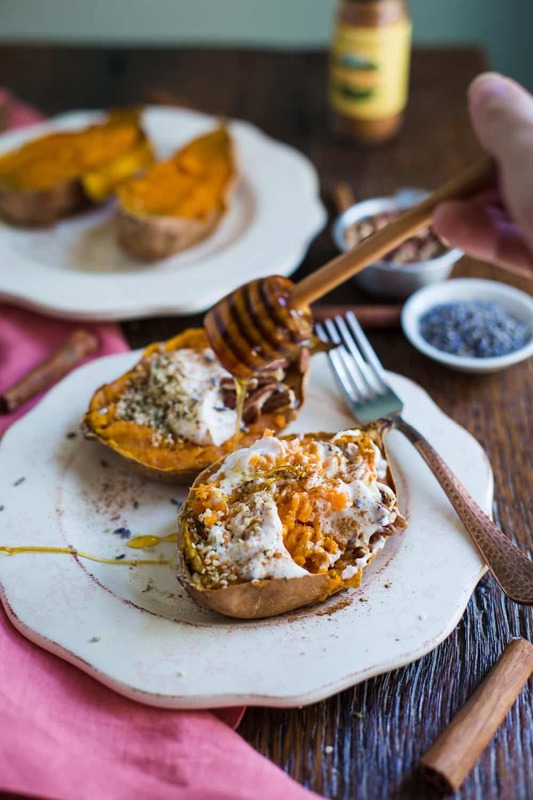 Prepare sweet potatoes by piercing each sweet potato with a fork a few times. Place them on a baking sheet and bake for 45 minutes to an hour. They’re done once a fork can be easily inserted into each potato. Using a fork, slightly separate the flesh from the skin of the potato. 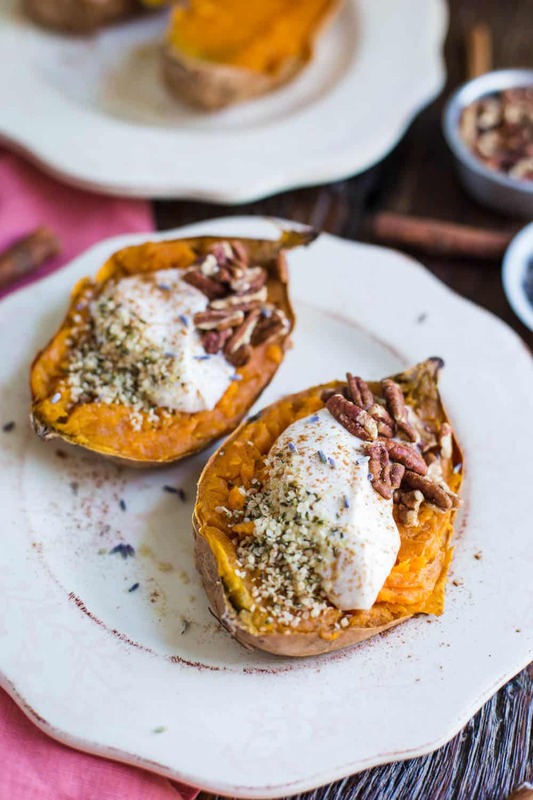 Even distribute the yogurt and the other toppings among the sweet potato halves. No matter how delicious they look that’s one I won’t be trying I’m afraid! 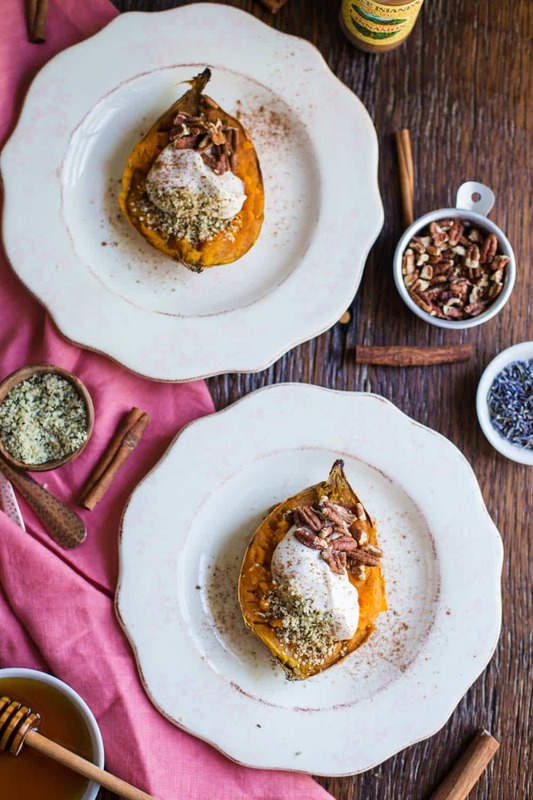 That sweet potato looks incredible! I love it! Never thought of having it for breakfast with some topping of sorts. Thanks for the idea, the recipe and beautiful pictures! Thanks!! I never really thought of it either until recently and really it makes the perfect bfast! I’ve tried it with oats as well which was super filling. 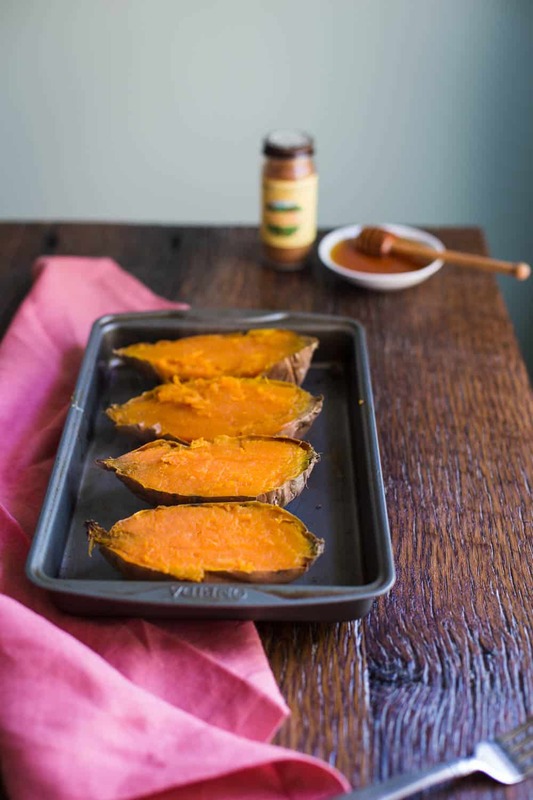 Hey Brita, I just came across this wonderful recipe and it is awesome as the baked sweet potatoes really tasted good after I tried out your suggestion. I just wanted to stop by and say that it was a wonderful recipe to have shared. Thanks for coming back to let me know, Tanisha!! SO glad that you liked it!